Andy Graff hadn’t written one creative sentence since editors rejected the novel he’d spent seven years writing. Two years had passed since the manuscript he’d labored over through college, grad school and beyond found a home in his dresser drawer, never to be read by anyone else. He put it aside and read it later that night. After finishing the essay, he picked up a notebook and wrote one sentence about boys pushing their bikes down a gravel road between marshes. It was that essay and this sentence that got him back to creative writing – that helped him pick up the pen again after his seven years of failure. 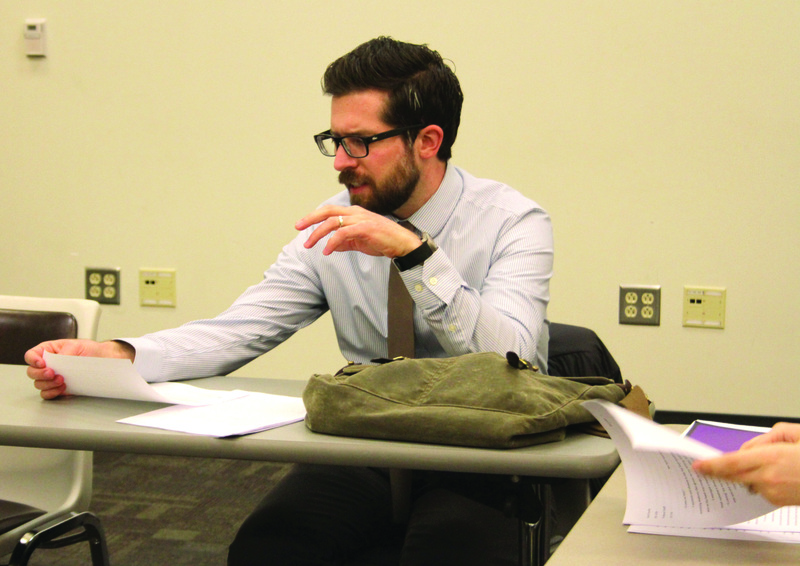 A creative writing professor at Cedarville University, Graff arrived at the school in the fall of 2015 with his wife, Heidi, and their son, Levi. Since then their daughter, Edith, has joined the family. The journey to Cedarville was rough and frustrating at times, but he said he doesn’t regret it because it changed him. Graff grew up on a hobby farm in Niagara, Wisconsin. As a child, he gardened, rode and fixed tractors, played in barns and hunted in the woods with his two brothers and his Alaskan Husky. The son of a mechanic at the local paper mill, Graff loved working with machines. When he graduated from high school, he joined the Air Force as a jet mechanic. After spending some time in Charleston, South Carolina, and Frankfurt, Germany, Graff went to Kandahar, Afghanistan, in the spring of 2002. “I look back at pictures of myself holding an automatic weapon at 19 years old and I think, ‘Wow, you didn’t know what you were doing at all,’” he said. Graff’s memories of Afghanistan are bittersweet. He decided to major in English because he’d always liked reading and writing. His sophomore year, he began writing his novel, but it started out as a first-person essay on landing in Kandahar. “The runway there was austere, it was packed concrete, it wasn’t meant to be landed on by 400,000-pound jumbo jets, so it was a really rough landing,” he said. What interested Graff about his story was the tension of a jet mechanic in a war zone. He had a war story without any combat in it. The story wasn’t working in a nonfiction format, so Graff decided to switch directions. He had a 200-page manuscript by the time he finished college, and he used it to get into the University of Iowa’s graduate-level creative writing program. At the Iowa Writers’ Workshop, Graff worked on his novel three to four hours every morning. He studied under Pulitzer Prize-winning authors, such as Marilynne Robinson and James Alan McPherson. The latter told Graff to try to get the novel published. So he did. Near the end of graduate school, he connected with an agent. He left the University of Iowa with a Master of Fine Arts in creative writing with an emphasis in fiction. He accepted a full-time teaching position at a community college in Green Bay, Wisconsin. He taught six or seven classes per semester at Northeast Wisconsin Technical College. The workload was so heavy he didn’t have time to work on his manuscript. “I had to, in some ways, drop the whole idea or self-image of Andy as budding novelist, just in order to survive and pay bills for a while,” he said. Graff spent his summers working on the novel, and two years into his teaching job at the community college, he tried selling it. His agent pitched it to several publishing houses, and in a few months, they had all gotten back to him. They said they loved the writing and that they thought the characters were true to life. But there was one problem with the manuscript, and it was consistent across the board. All the editors thought it was the most boring novel they’d ever read. And just like that, Graff’s dream of becoming a novelist died. When Graff got the news, he stopped writing. The next two years, he didn’t write a single creative sentence. He was filled with confusion. Graff grew up in a Baptist church, but his attendance was irregular at best. When he left home, church was not on his mind. “I did walk far and wide during my time in the Air Force,” he said. When he arrived at Lawrence University, Graff became enamored with postmodernism, and he said this influenced his novel. But Graff realized he couldn’t live his life according to a postmodern worldview. Graff started attending a small Church of Christ behind a park with a fountain. Graff saw that the people in the congregation had something his friends did not have. “What I noticed about them was they smiled a lot, and they used words like ‘hope’ and ‘peace’ without laughing sarcastically afterwards,” he said. Graff began attending church regularly, and he eventually placed his faith in God. In grad school, he got baptized. “I came back to (Christianity) as an adult, very seriously, having counted the cost, so to speak, and I haven’t looked back,” he said. Graff’s newfound faith influenced not just his everyday life but his current project as well. When he became a Christian, the novel began to fall apart. His new worldview didn’t mesh with the one he had presented in the manuscript. So in grad school, he tried to weave his new beliefs into the story. “I wrote what I thought were great scenes, like these characters were sitting on the wings of broken jets in the desert talking about God, and no one else thought that was great,” he said. Creative writing professor Andy Graff spent seven years writing a novel that didn’t get published. But that failure helped bring him to Cedarville (photo: Hannah Gallardo). After four years at community college, Graff felt it was time to move on. He was teaching composition to 30-year-old welders. He also taught technical writing and the occasional creative writing class. It was difficult, he said. Graff also wanted to teach in a Christian environment. He wanted no part of the relativistic worldview that he saw in many secular colleges. So he began applying to Christian liberal arts schools around the country. Meanwhile, at Cedarville University, the English Department was looking for a creative writing professor. It had a vacancy that hadn’t been filled since the spring of 2014. Kevin Heath, the department chair at the time, got ahold of Graff’s resume and saw that he had studied at the Iowa Writers’ Workshop. So Heath decided to take a closer look. In the early summer of 2015, Graff got a phone call from Heath. They talked, and Heath said he had a good feeling about Graff. Graff visited Cedarville for an interview that summer. During his visit, the department put together a class so it could see Graff teach. Senior English major Rachael Tague met Graff in that class. Graff was offered the position of creative writing professor, and he accepted it. That summer was a busy one for the Graff family. Graff finished teaching summer classes, sold the home, packed, found a place to live in Cedarville and moved. While all this happened, Heidi was pregnant with their second child. Senior graphic design and English major Elise Parsons was a student in Graff’s first creative writing class at Cedarville. Before she met him, her other professors had described him to her, but not in much detail. She expected a tall, blondish, military-type professor. Graff surprised her when he walked through the door of Ambassador 21 on an August evening last year for the first day of advanced fiction. Parsons said Graff was enthusiastic about the class. “The first thing out of his mouth was, ‘Hello, y’all. Getting this together was kind of like putting an octopus to bed here, but we got all the details sorted out, and four of you managed to survive it, so I think it’s going to be a good class,’” Parsons said. She said she felt she was going to enjoy the class after listening to Graff talk for a bit. He went on to tell us that the kind of class where you couldn’t figure out the logistics and you met in the bottom of an old house was exactly the kind of class he’d always wanted to teach,” she said, “which struck me as encouraging, because it was kind of the class that I’d always wanted to take. Heath said Graff has done well so far and that the future looks bright. Graff’s students agree that he’s done a good job of teaching. Tague, who took advanced fiction with Graff, said she likes his approachable personality. “My favorite thing about him is that he’s a professor and he’s really great at what he does, but he’s also a friend,” she said. Parsons said she admires Graff’s ability to approach different styles of writing. He also taught her how to write better descriptions. This idea of physicality, of making an imaginary world seem real to the reader, got Graff back to writing fiction. One Wisconsin winter night in early 2015, he brought out boxes of his old college notes to the fireplace. Instead, he used them to start a fire. He picked up pieces of paper and threw them into the fireplace, showing no discrimination. He came across Flannery O’Connor’s “On the Nature and Aim of Fiction.” He almost set it on fire, but instead, he set it aside. With this in mind, Graff picked up a notebook and wrote one sentence, making sure to apply what he had just read. This line has turned into Graff’s next manuscript. He began writing it early in the spring of 2015. He has not had much time to work on it since arriving at Cedarville, but he expects to finish it by early summer. Graff has no plans to rewrite, or revisit, his first novel. Graff said, however, that at the time, he was devastated his novel didn’t publish. “It felt like a complete failure, but it was good for me to learn how to deal with that,” he said. Graff said he enjoyed exploring the ideas of the novel because they were his to explore, but those ideas didn’t interest the editors too much. Graff said he’s glad the novel wasn’t published because it’s not indicative of what he believes now. When he looks back on the seven years he spent writing his first novel, he doesn’t regret it, he said, despite all the work he put into it only to see it fail. Those seven years turned Graff into a better writer, he said, but they made him a better person as well. “It taught me how to live, learning that truth wasn’t relative, that my characters and I brought the worst of the war upon ourselves via behavior,” he said. He said that the failure also shook him out of his idealized worldview. But the most important thing he learned from that time, he said, was how to wait on God. To master the art of waiting, Graff said, one must place complete trust in God. Graff waited for the job at Cedarville, he waited for his novel to take shape, and they arrived. Jonathan Gallardo is a senior journalism major and sports editor for Cedars. He has no idea what he’s doing, but he knows he’s doing it really, really well. No Replies to "Born Out of the Fires of Failure"